Design patterns: strategy » Hello World! I thought about it earlier. I even bought myself really interesting book recommended to me by many others: Head First. Design Patterns. I read some of the chapters but not all. And the book has been lain untouched on my bookshelf for a little bit more than a year now. So, an idea has come to my head with the goal I would like to achieve this year: I will be describing here a design pattern from the book each month. This month I would present the strategy design pattern. Pretty simple — as the new requirement presented on next pages of the book: “we would like to add flying ducks to our application”. The first idea which came to the mind was to add fly() method to our base class Duck. But it was not as good idea as it supposed to be: probably another developer added RubberDuck sub-class to the simulator and it started “to fly”. And it was not well-received during demo of the application. We could stop here and think about what if there are other types of ducks which do not fly or event do not quack? Keeping in mind that we need overwrite their fly() and/or quack() methods does not sound as the best way to use our time. What is wrong with this example (it seems quite logic, doesn’t it)? 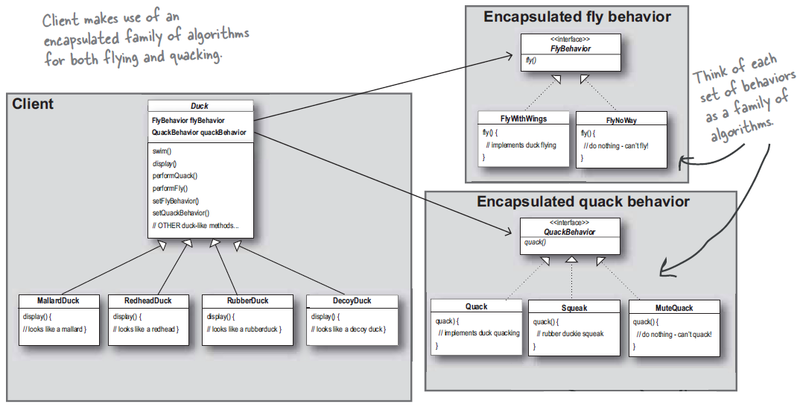 Well, the duplication of code is something we should always avoid (quack() methods in alive ducks’ classes). Also, the time spend on introducing new sub-class is even longer than overwriting two methods. After this funny example we are introduced with strategy design pattern. I used here some kind of UML-like diagram instead of putting more code. However, I re-written the code from Java to PHP and you can download and run in a terminal. KnifeBehavior, SwordBehavior, AxeBehavior, BowAndArrowBehavior classes. I will not put the solution here just in-case if anyone would like to solve it But this is the second example in the book of use of strategy pattern. The examples in the book do not have much in common with web development, do they? So, once I have made my mind to write this post I checked Internet if there are any good examples. Of course, there are plenty of them. But the top of searching results, I found, were about different ways of displaying a book title, finding a transportation way or encapsulating different database algorithms. The Strategy Pattern defines a family of algorithms, encapsulates each one, and makes them interchangeable. Strategy lets the algorithm vary independently from clients that use it. W tematyce wzorców projektowych w PHP polecam książkę, którą czytałem: PHP. Obiekty, wzorce, narzędzia. Wydanie III Matta Zandstry – dużo przykładów wzorców i interesujące poboczne tematy. Zajrzyj jak będziesz miał czas.